Google is always trying for clever ways to help users through its search engine, having recently added real-time tweets to the desktop and adding a "Buy on Google" button on mobile. This time, say you're bored or need to brush up on your trivia, you can head on over to Google, type in 'fun facts' - and Google will deliver. 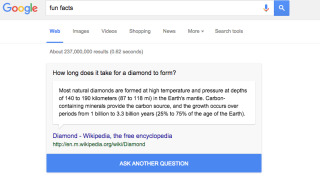 As shown in the image, Google will show a random fun fact in a window, along with a link and an 'Ask Another Question' button on both mobile and desktop. If you click the 'Ask Another Question' button, your Google question will change to "I'm feeling curious", which will give you a fun fact as well. Now, go forth and be entertained.